One of the most spectacular “must-see” spots in Colorado. Stunning mountainous landscapes are visible from many different locations, as well as creeks, rock formations, elk, and lush plains. 1.5 hours from Denver. $50 photography permit fee. Vast mountain top views of the city below, surrounded by forest and pine trees. Grand red rock formations surrounded by sweeping views of the mountains in the distance and lush greenery. Located in Colorado Springs. Gigantic jagged red rock formations create an other worldly landscape. Located in Fort Collins. Photos can be taken right by the water, or higher up with aerial views of the deep blue lake below. This location is adorned with interesting rock formations and a Mars-like terrain. 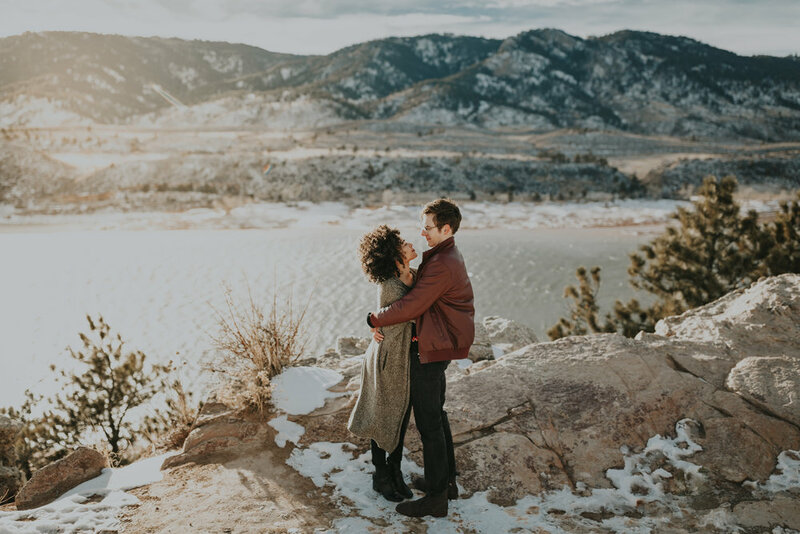 What better way to explore the historic neighborhoods and stunning architecture of Denver than with a couple’s session? Booking your elopement based out of downtown is another great option. Industrial buildings, cozy homes, murals, blooming flowers, vibrant trees, and brick walls are just some of the downtown elements that we can incorporate into your photos. Lakeside views are surrounded by distant mountains and evergreen trees. Wooden foot bridges lead you around the lake.